EVgo announced that it is exploring new ways of using second life batteries. It will put an effort into the initial construction of the batteries for electric cars and their primary, secondary, and maybe tertiary use cases. First of all, EVgo will add the used BMW i3 batteries in its grid-tied public fast charging system. The first such system will be set up in Union City, California. The system is expected to reduce the strain EVgo fast charging systems can have on the grid, by using the residual storage capacity of the batteries. It will store the energy during peak solar generation times and dispense it when it is needed. Second-life batteries have been removed from cars that have been in an accident or that have degraded to the point where they are ineffective to use in a vehicle. They can be used together in much larger stationary storage arrays, where the density is not that important. It will prolong the lifespan of batteries and will maximize the value that can be extracted from the battery, spreading the energy, carbon emissions, and investment in the initial battery over a longer period of time. The new site will use four BMW i3 battery packs with a capacity of 22kWh each to make two 50kW Dc fast charging stations. Additionally, a 30kW inverter will be used to avoid demand charges. The logic governing of the system was developed by energy management solution provider Kisensum, and the hardware was created by Princeton Power Systems. 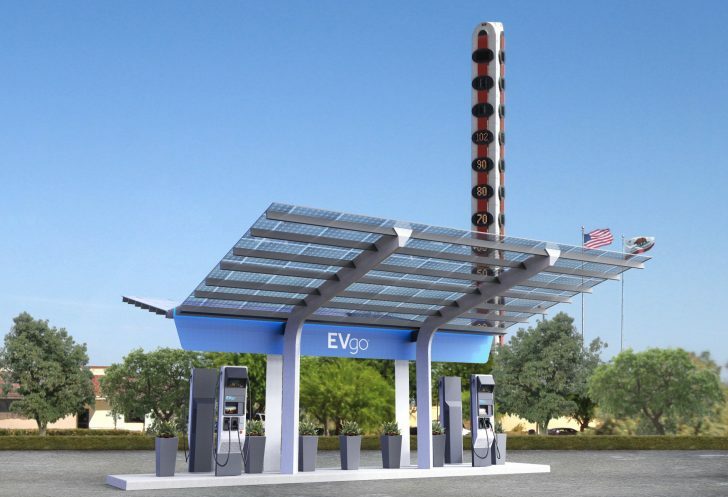 EVgo believes that this project is a core technology for enabling affordable fast charging.